Ms. Annie G. Haywood, 73, of Lumberton, transitioned from time to eternal peace on April 9, 2019. 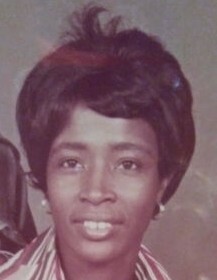 Annie Gladys Haywood was born on October 5, 1945 to the late Sam and Gladys Brunson of Conway, SC. Gladys was in the mist of ten children, seven boys and three girls. She has always wanted to be the best of everyone., she couldn’t boss the older ones but she got her way with the younger ones which meant me and my brother and sister, which we did not listen to her. Gladys was educated by the Proctorville School System in NC. She went on to start a new life by engaging in marriage to Tommy Lee Haywood. The were Married on November 26, 1962 and to this union three children were born. Gladys was a professional seamstress in the New York Garment Industry in Mt. Vern, NY, where she worked for over 10 years. She decided to retire with her family back to her hometown in Lumberton, NC. Gladys professed her life in Christ and was saved in 2002 and went on to join Mt. Zion Free Will Baptist Church at 194 Progressive Farm Rd. Fairmont, NC . Gladys loved her church and church family too. She was always in a smiley attitude. She was a devoted wife , mother, friend and always thinking of others. Gladys was always putting her family first no matter if she was feeling good or not. She would put her husband first in the mist of her sickness. That tells you what kind of women she was. She leaves to cherish her loving memories, her husband, Mr. Tommy Haywood of the home, three children, Tommy Haywood Jr of New York, Diana Haywood and Bobby Haywood both of Hartford, CT; nine grandchildren, three great grandchildren, one sister, Pastor Linda Patterson of Holly Springs, NC and a host of nieces & nephews and other relatives and friends.